Eyebrow expert, Anastasia Soare - first Oprah's brows, now Lisamarie's - is there anywhere for her to go from here...? There aren't a lot of things in life that will entice me to get out of bed early on a Saturday morning but a chance to meet with eyebrow expert to the stars and creator of the Anastasia Beverly Hills line, Anastasia Soare is one of them! As I explained to my husband when he questioned what the hell I was thinking - it's not often, if ever, that you get the opportunity to meet THE eyebrow guru and I wasn't going to miss it dammit! The biggest complaint I hear as to why people don't do anything with their brows (and is also my excuse) is that they don't know what to do and it seems complicated. Not so. 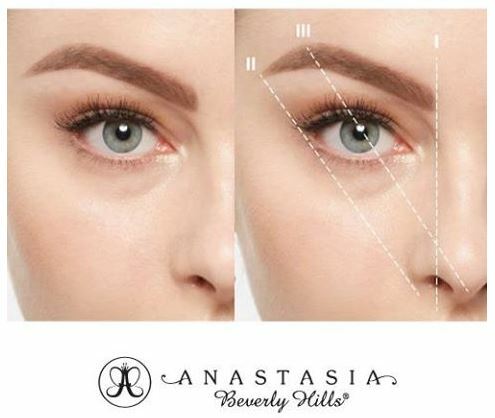 Anastasia is the creator of the eyebrow golden ratio which is only the easiest way to figure out the perfect size and shape for your brows - as shown in the picture. Just use a pencil and hold it straight beside your nose and that's where your brow should start; angle it beside your nose to the outer corner of your eye and that's where it should end; and angled from the middle of your nose through the center of your eye is where it should arch. This formula creates the perfect brow no matter what the shape of your face is. And here's the after - Anastasia combed my brows up, filled them in and accentuated the arch for a more polished look and an instant eye lift - see, I look just like Brooke Shields! If you have sparse brows like me, Anastasia recommends using the Brow Enhancing Advanced Serum - $49 - which contains five peptides at 10% and encourages the growth of fuller, thicker-looking brows. From the rest of her line, I'm partial to the Brow Wiz - $27 - which creates precise lines for evenly defined brows and has a smear-proof formula that lasts all day - it comes in 9 shades including an Auburn one which is not a shade that is normally easy to find let me tell you so I am super pleased to have discovered it! Anastasia Beauty Express for Brows and Eyes - $51 - includes everything you need for perfectly groomed brows on the go. The portable palette contains a Brow Powder Duo, Brow Wax Cream, 5 stencils, and an Angled Brow Brush with a mirror and instructions all in one convenient place. Available at Sephora, sephora.ca and Murale. You met Anastasia?!!? Ahhh you're so lucky! I love her!